US ArmyBGM-71 TOW, variant M220, SABER. U.S. Army PFC David Mitchell scans the landscape surrounding Vehicle Patrol Base Badel at the mouth of the Narang Valley in Konar province, Afghanistan, May 9, 2009. Mitchell is assigned to the 1st Battalion, 32nd Infantry Regiment. The base has closed down enemy activity in the valley and in Narang, Chowkay and Nurgal districts. The TOW, first introduced in 1970, is a very effective weapon system that can take out tanks, other heavily-armoured vehicles, and bunkers. It can be fired in a ground role on a tripod, or mounted to a vehicle. This marks a big shift in the policy of the U.S. toward Syrian rebel groups fighting Assad forces, as so many disparate factions blur the spectrum from freedom fighter to hardline extremist. 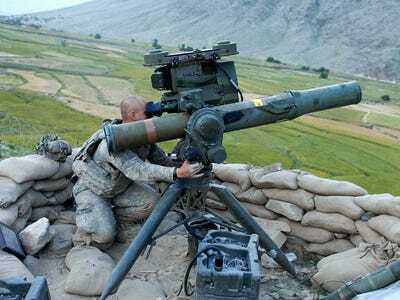 While the U.S. had already been supplying small arms such as rifles to vetted rebel groups, advanced weaponry such as anti-tank and anti-aircraft weaponry would considerably level the playing field.